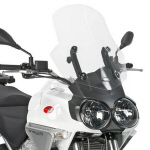 Lowered Gel Rider Seat For 1200 CapoNord -2S000042 Official Aprilia Accessory. 25mm lower than the stock saddle. OEM Aprilia Tall Windscreen - 2S000065 For '14-'17 Caponord 1200, '16-'17 Caponord 1200 Rally. Tank Side Grip Pads for '14-'16 Caponord 1200 and Caponord 1200 Rally Made in the U.S.A. by Stomp. OEM Aprilia "Aprilia" Dataplate -#AP8157770 For '11-'19 Tuono V4, '14-'17 Caponord 1200, '98-'03 RS250, '00-'03 Mille, '01-'07 CapoNord, '04-'09 RSVR, RSVR Factory, and '06-'10 Tuono. Aprilia Logo Stickers - 4 pack High quality vinyl stickers measuring 2.75" x 1.5"
OEM Aprilia Hex Hex Bolt (M6X30) - 874551 This is the bolt that is needed on '14-'15 Caponord 1200 when the evap canister is removed.